Many of the older village homes in Henham are timber-framed and may have been significantly altered over the centuries. Fortunately there are experts such as Leigh Alston (who lectures in the Department of Archaeology at University of Cambridge) who can identify those changes and give an explanation and timescale of the evolution of a building. Many homes began as a single-roomed multi-occupancy home for family and servants with an opening in the roof to enable the escape of smoke. Now they have become the highly desirable, two-story, low-ceiling, thatched-roof, four-bedroom, single-family house of today. 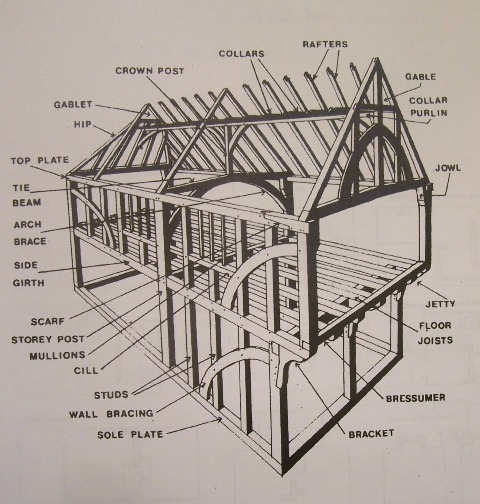 On 25th March 2006 Leigh gave a one-day class at Clavering on timber-framed houses. 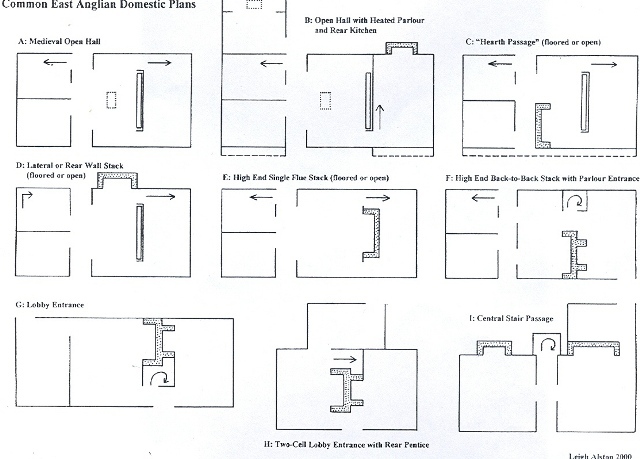 He explained the layouts and construction, the development of the domestic house 1300 - 1700, and how to date the structure by reference to carpentry and decoration. With his permission, here are some notes of that interesting lecture. There was no glass in the buildings so ventilation was by shutters and doors which were used to move smoke in a chosen direction out of the house, and generally improve ventilation. One to two dozen people lived in each building so there was little or no privacy. The hall might also be used as a workplace during the day and as sleeping quarters for everybody at night. The whole house wass highly structured with a social need at one end and a higher standard at the other end. Pegs would be better quality at the ‘top’ end. 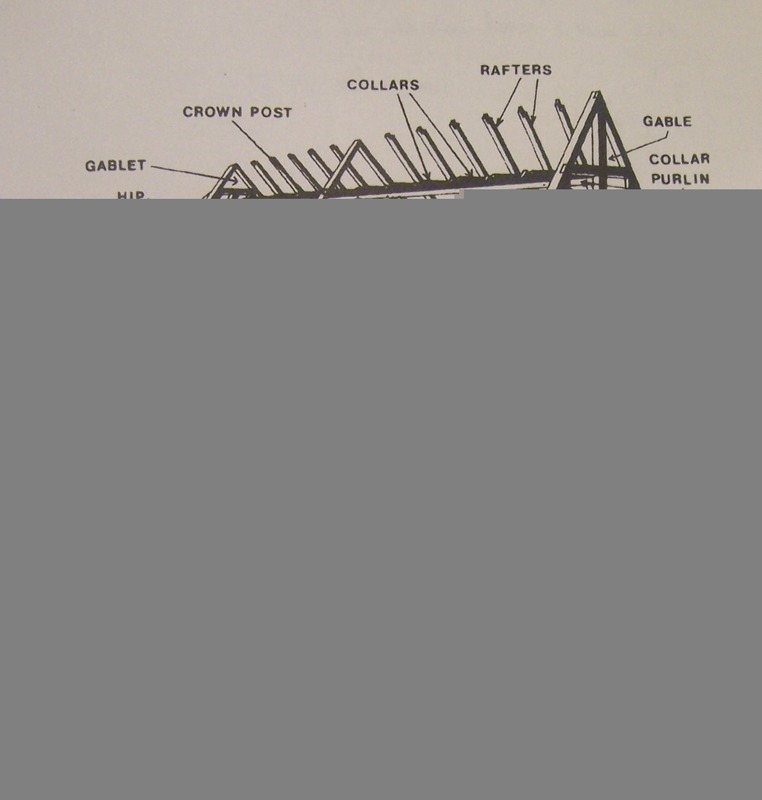 Wooden beam pegs were inserted with the tapered end towards the lower end of the hall. The tops of the pegs were flush whilst the tapered end might extend for some inches. Mortice and tenon joints with long wooden pegs were known as trennels. You can identify where earlier windows and doors may have been by the gaps left in the remaining beams. Today the doors in these old houses appear lto be low.The apparent lack of height to the rooms was thought to reflect the stature of the adult population but in the fifteenth century the average man was 5′ 7″ and the average woman was 5′ 2″, not so much different to today. In fact the original door would have been higher than those of today. The apparent low-ceiling is because the building has sunk or the worn-out clay floor has been repeatedly re-surfaced. As the carpenter built the house, he would also make the furniture and attach it to the wall. Examples are settles and benches. The carpentry would be rudimentary since items such as tables would be covered with cloths. Windows were sited towards the high end of the hall. In the C15th ceilings became the new fashion. The cross-passage layout starts to disappear in the C17th. Shingles for roofing were made of split oak. In towns tiles were used whilst low-status buildings and farms were thatched. Many houses that currently sport a thatched roof, would have originally been built with a shingle roof (we have seen this type of roof in most of the first-settler buildings displayed at Plimoth Plantation, Massachusetts, USA). Oak is a very strong wood if it is well-ventilated. Trapped air, for example in a roof, will cause infestation problems such as death-watch beetle, therefore buildings were converted to thatch. Glass was 4 pennies when 2 pennies was an average salary. You couldn’t see through medieval glass until it was sufficiently improved by the last 1/4 of C16th. Due to The Black Death, a lot of the countryside reverted back to oak & ash woodland. Consequently we suddenly started to harvest more timber by C17th.